Home/Educational Activities, Main Page, Teaching/Why Would a Dinosaur Not Make a Good Pet? As part of the extension activities suggested by Dinosaur Mike of Everything Dinosaur during his visit to Bishop King CE Primary School (Lincoln, England), to work with Key Stage 1, the children in Year 2 were challenged to have a go at designing their very own dinosaur. Having met Tyler and explained that in the past a huge marine reptile roamed the seas of what was to become the United States of America, one of the company’s “pinkie palaeontologist challenges” was set. 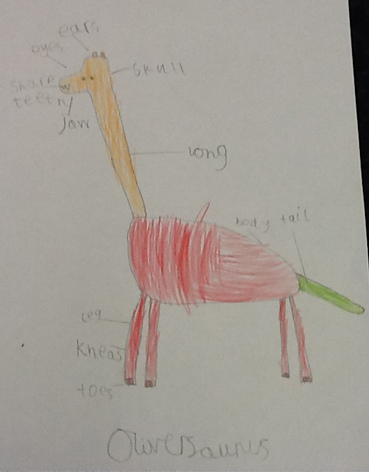 Could the pupils come up with their very own prehistoric animal? The children took to their task with gusto. We challenged the class to think carefully about their dinosaur, what colour would it be? Would it have a long neck or a short neck, a big body or a little body? We wanted to see lots of lovely labels including pointing out where the dinosaur’s skull was, a word we introduced to the classes during our fossil handling activities. The term topic for the two classes of Year 2 children this autumn has a science focus. The aim is to decide whether or not a dinosaur would make a good pet. This subject area acts as an umbrella topic, linking in with exploration of food chains, habitats and life cycles as well as learning about different parts of the body. This particular extension exercise dovetails nicely into art as well as supporting literacy, vocabulary development and handwriting skills. A very colourful dinosaur design. When it comes to providing posters for conferences detailing research, it is important to provide accurate, well annotated diagrams. This is a useful skill within palaeontology and it seems from these examples here that the pupils at Bishop King CE Primary have started to hone their science skills at an early age. Our congratulations to the children in Year 2, they have come up with some beautiful and very colourful dinosaurs and Everything Dinosaur team members were most impressed with all the clear labelling. We hope our dinosaur workshop went some way to help the children to answer the question why would a dinosaur not make a good pet?